Poly(malachite green) film coated carbon paste electrodes were fabricated for sensitive and selective determination of dopamine in phosphate buffer solution at pH 7. 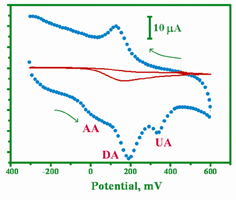 Well enhanced redox peaks were observed with limit of detection 2.5 x 10-7 by cyclic voltammetry. Further investigation showed the oxidation of dopamine was shifted negatively by increasing the pH. The effect of concentration and scan rate results in a linear response and the overall electrode process was diffusion-controlled. The modified carbon paste electrode acts as an electrochemical sensor for the determination of dopamine. Simultaneous investigations resulted in excellent potential difference between dopamine and other neurotransmitters by using both cyclic voltammetric and differential pulse voltammetric techniques.